Please login to view more content. This is the first Vue.js 2 and Laravel 5 book! Get the book now save 34% before the price goes up! This is the first Vue.js 2 and Laravel 5 book! More than 800 coders have purchased this book! Grab yours now! 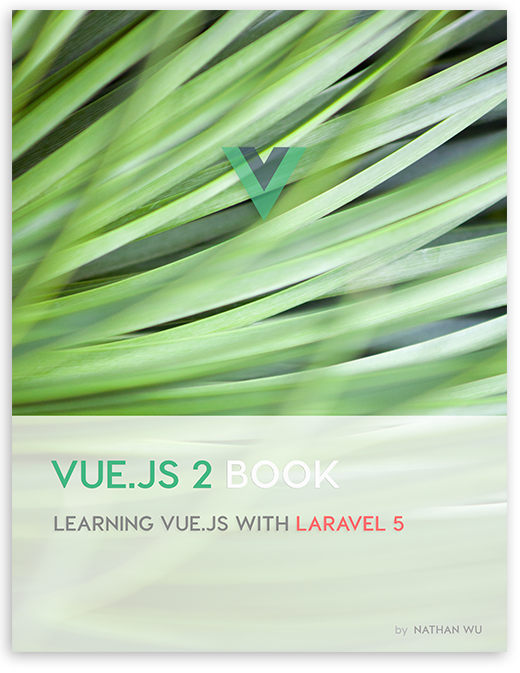 Vue.js 2 Book: Learn Vue.js with Laravel 5 and Bootstrap 4 is one of the very first Vue.js books. Throughout four chapters, instructor Nathan Wu will show you how to build practical Vue applications from scratch. This book has been structured very carefully, teaching you all you need to know about Vue and its features. Throughout the book, you'll also learn and build many real-world features: Vue single-file components, CRUD operations, form validations, JWT authentication, APIs, etc. We first start with the basics. You will learn some main concepts and create a simple website. After that, we progress to building more advanced web applications. By the end of this book, you'll gain a solid understanding of Vue and how it interacts with a Laravel backend. If you want to get up to speed in VueJS as quickly as possible, this is the number one book for you! A community of 100000+ students learning together. Amazing bundles and freebies to help you become a successful developer. iPhone, iPad and Android Accessibility. In this chapter, we will learn how to set up the development environment and run our first Vue app. After that, we will build a simple Vue application. After installing Vue, we're going to build a simple image gallery to learn about the structure of a Vue application. You'll know how to create Vue components, how to integrate Bootstrap into our app, and understand other core concepts of Vue. It's time to build a backend for our Vue applications. We'll learn how to install Laravel PHP framework and build APIs with Laravel 5. After that, we'll connect our Vue app with the Laravel backend. By the end of this chapter, we'll explore vue-router - a powerful Vue routing module. Feedback from our readers is always welcome. Let us know what you liked or may have disliked. We're also looking for translators who can help to translate our book to other languages.